Dimensions: external 40x40cm, internal 34x34cm, height 85cm, weight 7kg. Available colors: white, taupe, oriental red, petrol blue, bronze, anthracite. Material: polyethylene with UV treatment. COSMOS cachepot, is able to give a touch of design and modernity in any space. Its height of 85 cm makes it especially suitable for outdoor environments of large dimensions and is ideal to place a corner of nature poolside. 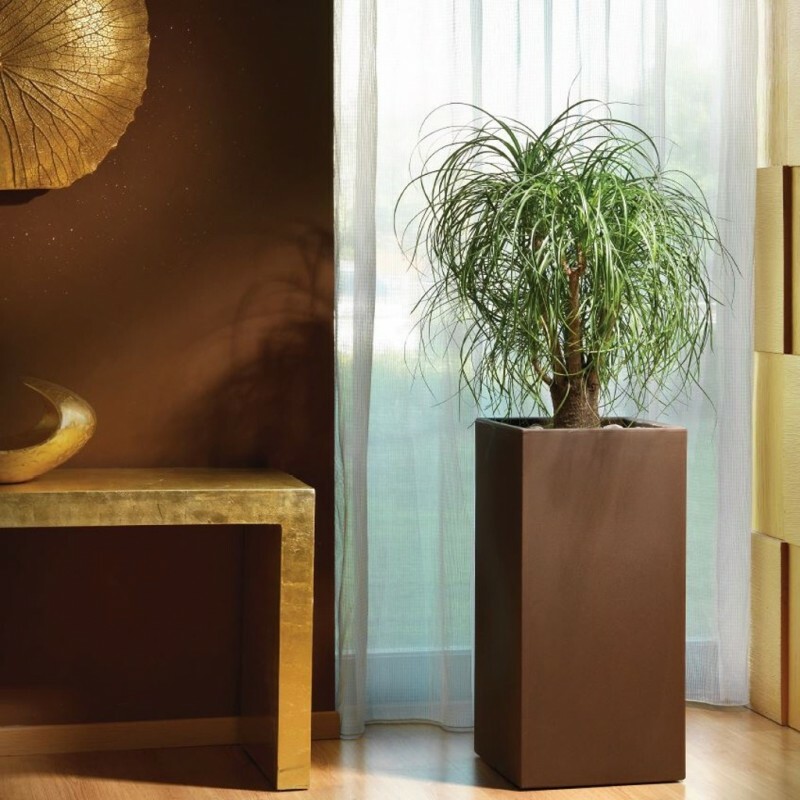 With modern design and from the essential lines, COSMOS cachepot is a high build quality product, a complement that will help make elegant and refined yours outdoor space as well as the interior of your home. Each model of the COSMOS line comes from the idea of fusing a floral touch with the surrounding environment, creating a seamless harmony. In addition, the double-walled design system, guarantees greater thermal insulation, creating around the plant, his piece of the world. IMPORTANT: cache-pot vases, are distinguished from common vases for the presence of a double bottom, positioned according to the size of the cache-pot, at different heights. See technical data sheet in the "Download" area. Discover the other COSMOS models, see below in related products. QUALITY THAT COUNTS: people determine success. LYXO is part of VECA S.p.a., a “Made in Italy” international brand that has been turning plastic into functional design for almost 30 years; 6 production plants with a total surface of 25.000 square meters, 40 innovative production machines both for injection and rotomoulding; exclusive use of 100% non-toxic and recyclable materials; 25 million pieces and 10.000 orders managed every year. Important numbers that tell a great reality. TECHNOLOGY, IN THE HANDS OF ARTISANS: without the hand of man, technology is just mass production. The people who make up LYXO are evolved artisans: rotomoulding is the technology that enables to the plastic mould, to rotate on two axes at the right times and in a uniform and precise manner. But it is only the human intervention that defines the finished product, thanks to thorough checks of shapes and details that must be perfect. Only then a beautiful product becomes a LYXO product.